Acupuncture and Chinese medicine are effective in treating a wide range of conditions of the eye. For some conditions, such as macular degeneration, retinitis pigmentosa, Stargardt's disease and other retinal diseases which have limited treatment in Western medicine, acupuncture is the treatment of choice. For other diseases, such as cataracts (in the early stage) and chronic (open-angle) glaucoma, acupuncture can be beneficial as an adjunct therapy to Western treatment. The Yellow Emperor’s Inner Classic or Nei jing, the most important ancient text in Chinese medicine, teaches “the Liver opens into the eyes”. The Liver is the primary organ relating to the eyes in Chinese medicine, although in practice, all of the internal organs have some relation to the eyes. That is why diagnosis of eye disease is not just based on symptoms and signs but also on a more extensive pattern of the entire body. The causes of eye and bodily diseases are the same: the dysfunction of the internal organs leads to eye and other disorders. You cannot separate the eyes from the rest of the body. In traditional Chinese medicine (TCM), it is said that the spirit “shows in the eyes” and “is housed in the heart.” These sayings indicate a direct relationship between thinking and eye function. 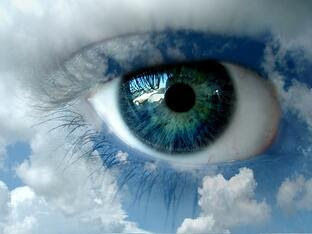 The attitude of a person has a direct and immediate effect on the Qi in the eyes. TCM eye reading or eye diagnosis combined with pulse and tongue diagnosis are the most effective ways to determine the best treatment for each patient, and can aid in early detection for preventive management. It is also helpful if patients bring their medical records from recent eye exams. Someone who is educated in TCM ophthalmology can provide thorough treatment of eye diseases through acupuncture and Chinese herbs. As a practitioner, my main objective is to bring Qi to the eyes while treating the overall organ imbalances and the person’s unique constitution. I also usually coach my patients to assess their attitude towards life, as well. Age-related Macular Degeneration (ARMD) is the most common of a number of degenerative conditions that can affect the retina. It is also the leading cause of blindness in older adults. According to epidemiologists, there are almost 5,000 new cases diagnosed each day and by the year 2010 there will be 30 million cases of ARMD in the United States alone. [i] There are some studies that suggest that almost 25% of adults over the age of 65 show some evidence of deterioration in the macular region. [ii] Right now, there is no cure and no treatment for ARMD in conventional medicine. Linda came to me with the "wet" form of age-related macular degeneration (ARMD), the leading cause of vision loss and blindness in people over the age of 65. She had had laser procedures 3 months prior to coming into the clinic. After reviewing the medical records from Linda's recent eye exams, I treated her with acupuncture (body points, scalp points, ear points) and prescribed herbal medicine. Two months later she showed improvement as measured in visual acuity testing and also showed marked improvement in her scoring on color testing and overall visual fields. I also teach my patients how to do self-massage around the eyes. Eye massage is popular in China to prevent children from becoming near-sighted. For mild eye problems, these simple massage techniques can be of great benefit. In severe cases, eye massage is a useful supplement. Through the guidance of an acupuncturist who has been trained in this therapy, a patient can easily learn eye massage and do it at home for mild eye disease like dry eyes and eye strain. There has been extensive research done on the importance of specific foods and dietary supplements for people with degenerative eye diseases. Diet, supplements and vitamins can slow the progression of macular degeneration and retinal disease[iii], and when combined with acupuncture and herbal treatment provide a course of treatment that is more effective. For example, blueberries improve night vision, affecting the production of visual purple and assisting the optic nerve. Goji berries have been used for 6,000 years by herbalists in China to protect the liver, help eyesight, boost immune function, improve circulation, and promote longevity. Goji berries, also known as Lycium barbarum, wolfberry, gou qi zi, and Fructus lycii are usually found dried. They are shriveled red berries that look like red raisins. Shengyan ‘Grace’ Tan, PhD, MD (China), OMD (China) served as an acupuncturist, herbalist, and clinical supervisor in the ENT and Ophthalmology Department of the teaching hospital of Chengdu University of TCM for four years. She has also served as a clinic interpreter, instructor, and lecturer and has published several peer reviewed papers. She is the first PhD-trained TCM practitioner specializing in ophthalmology to teach in the United States. Dr. Tan brings energy, knowledge, and clinical experience to the AOMA faculty. At AOMA Tan teaches TCM Diagnostic Skills I and II, Herbal Safety, Herbal Patents, and Clinic Theater 1, and supervises clinic rotations. She has been a faculty member, clinical supervisor, and acupuncturist at AOMA since 2011.